The Monaro Highway. A new alignment would be safer and faster. Photos: George Tsotsos. 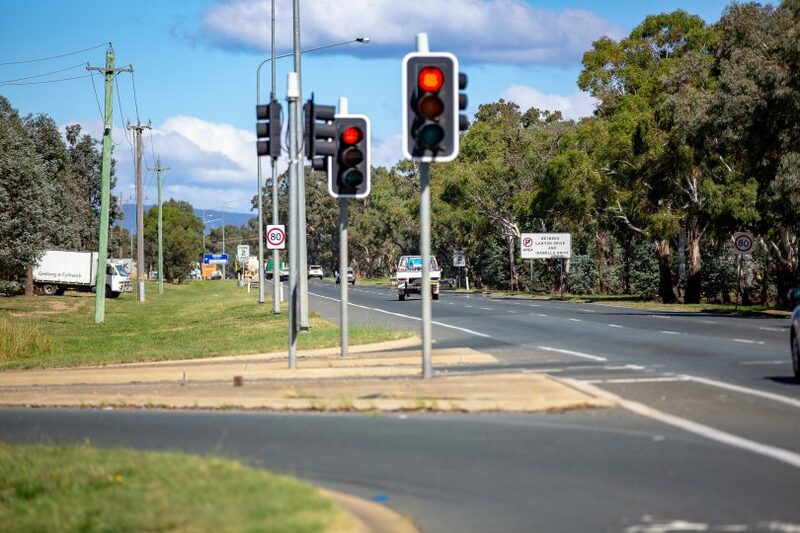 Tender documents have revealed the full extent of recently announced works on the Monaro Highway, including a proposal for a new alignment from Isabella Drive to Lanyon Drive that would pass close by historic Woden Homestead and Rose Cottage, and cut through the Mugga Lane Solar Park. Senator for the ACT Zed Seselja and ACT Minister for Roads Chris Steel had announced the release of a tender for feasibility and preliminary design that they said would investigate intersection upgrades from Johnson Drive in the south through to the access road to the Alexander Maconochie Centre, including intersections with Lanyon Drive and Isabella Drive and intersections with Mugga Lane, Tralee Street and Sheppard Street into Hume. But they did not mention that it would involve a major realignment of the highway as part of the $200 million joint Commonwealth-Territory funding package. The documents show the proposal would have a posted speed limit of 100 km/h with a design/operating speed of 110 km/h. 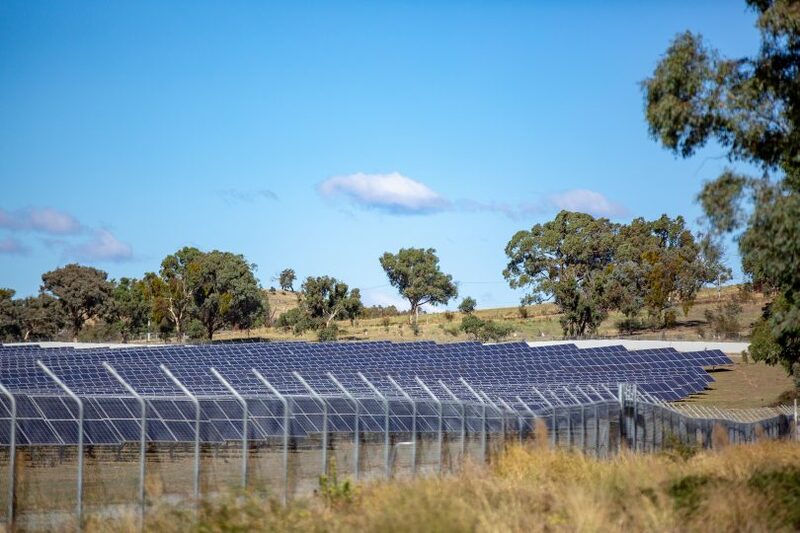 Originally two options were considered, with one linking back into the Monaro Highway just north of Mugga Lane, avoiding any impacts on the Mugga Lane Land fill and Solar Farm. But it was ruled out because it would impact on services in the Monaro Highway corridor between Mugga Lane and Isabella Drive and would be difficult to provide a grade-separated roadway through this section of highway. It would also not be possible to attain an appropriate alignment for a 110 km/h design speed, and it would cut through the West Hume industrial area. “The full alignment from Isabella Drive to north of Lanyon Drive does not have these limitations, and consequently is selected for investigation,” the documents say. 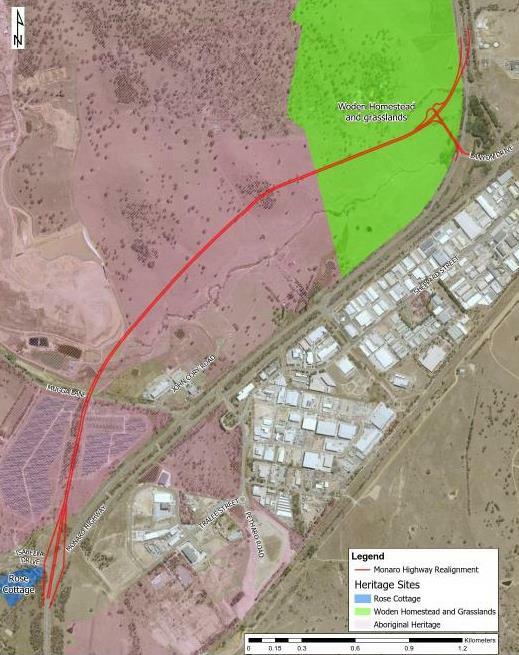 However, the proposal faces challenges due to impacts on Woden Homestead and Rose Cottage, the habitat of the Grassland Earless Lizard, Aboriginal heritage and the trees on the solar park which would have to be cleared. There is also the possibility of contamination from the Mugga Lane tip. The documents say Woden Homestead is significant as one of the earliest rural properties on the Limestone Plains (now Canberra), while Rose Cottage Inn is important both as a manifestation of pioneer life in the region and as evidence of traditional construction techniques. Both are registered under the ACT Heritage Register. The proposal cuts through Woden Homestead and Grasslands, and for Rose Cottage the documents say that if the alignment is constructed within the road reserve, the likely impacts would be visual, noise and vibration, but if it infringes into the curtilage the risk of significant impact on the heritage values would be higher. At the Solar Park, the proposed alignment passes through the tree-lined creek corridor retained within two clusters of solar panels, which is part of the layout design of the solar farm and would have to be acquired by the Government. Other construction issues include potential dust affecting the solar panels, underground cables connecting both sides of the solar farm needing to be protected and/or relocated, and preventing and minimising the impacts to the solar farm operations. Mr Steel said when announcing the tender that the Monaro Highway was an important recreational and freight route between the ACT and NSW and these upgrades would significantly improve safety on the stretch of the Monaro south of Canberra and decrease travel times during the busy ski season. “The aim of the Monaro Highway upgrades will be to safely achieve a consistent speed limit of 100km per hour from Johnson Drive to Hindmarsh Drive, to keep Canberrans moving,” he said. What a fantastic infrastructure initiative, and at last a positive initiative for residents of Eastern Tuggeranong. Well done Zed. You are the only elected Fed that cares about Tuggers! The current Isabella Drive/Monaro Highway roundabout, constantly choked and rat-run, and when not choked(at night time) all we here are all the Heavy Trucks with their non-stop Exhaust Brakes screaming their head off (Where is the police noise enforcement!) to get around a down-hill tight roundabout. Gets rid of Mugga Lane lights, hopefully fixes the Lanyon Drive intersection disaster, and also the Maconochie Centre lights/disaster that always should have had an access road direct to Hume/Lanyon Drive roundabout. A 110km road along the Monaro Highway onto Federal Highway, is what is needed for a growing truck freight road, and high density commuter road. NO DOWN sides, lack of braking noise from Exhaust Brakes and Traffic Lights and associated pollution, makes up for being a bit closer to residential areas in Macarthur and Chisholm, and it will clean up the area east of the tip. GREAT INITITIVE, and l-o-n-g overdue! Seems like a pointless waste of money. It’s certainly slow for a little while in the mornings and afternoons, but not disasterously so. Definately not as bad as getting in and out of Gungahlin. Fix the existing intersections / interchanges / roundabouts at Johnstone Drive, Isabella Drive and Lanyon Drive, teach Canberrans how to mergre and the problems go away. The Monaro is already dual carrigeway, just needs to be tweaked a bit in it’s current location. That proposed alignment will bring all the Monaro Highway traffic noise a lot closer to the approved new cemetery and crematorium in Long Gully Road. Given that there is a lot of noise, odour, dust and heavy truck movements already eminating from the MLRMC (Canberra’s largest and dirtiest industrial site) it was a really dumb decision to site the cemetery (and sneak in a crematorium) where it is to be Long Gully Road. Friends and relatives of deceased people being fare-welled at the new site could very well be distressed by the aforementioned problems but nothing stands in the way of “progress” does it. Rather melodramatic even for you! Is there anything “new” you agree with? Oh BTW I’m not so sure about this proposal but more rational thought is what is the purpose of the new alignment not that some funeral a km or so away may be upset, it doesn’t seem to be much of an issue out at Mitchel where the cemetery and crematorium are much closer.